DA Form 4700 - also known as the "Medical Record - Supplemental Medical Data" - is a United States Military form issued by the Department of the Army. The form - often mistakenly referred to as the DD form 4700 - was last revised on February 1, 2003. Download an up-to-date fillable PDF version of the DA 4700 down below or look it up on the Army Publishing Directorate website. specialize in their interpretation at a later date and you will be contacted if there are findings different from the emergency department. Stitches/staples removed in ____ days by PCM/ED. Metformin and IV contrast: Your medication list includes metformin. symptoms of low blood sugar call yout PCM or return to the ED. Medication reconciliation completed by ED provider and list given to patient. member or the pharmacy if you have questions. Make an appointment in _____ days at your primary care managers clinic, or sooner if you become worse. A physician was consulted to continue your care in the _________________________ clinic. Please call for an appointment. noted above. I understand that if there is a serious change in my condition I should contact my regular clinic or return to the ED. YOUR FEEDBACK IS IMPORTANT TO US! 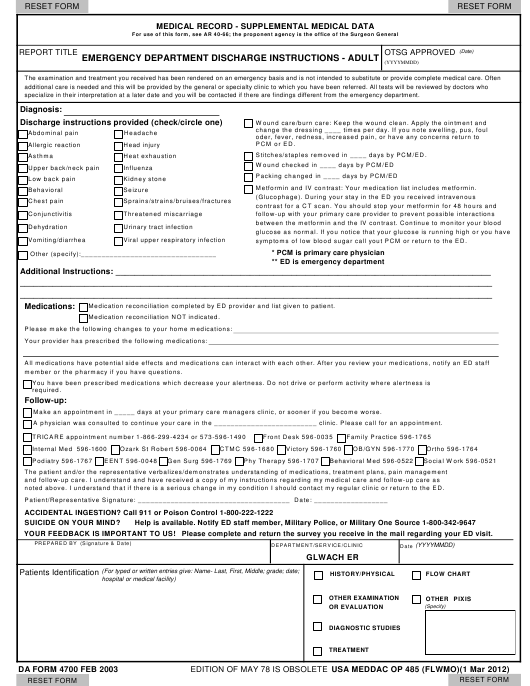 Please complete and return the survey you receive in the mail regarding your ED visit.